As regular readers will know, the Bioscope tries to keep an eye on the various newspaper and journal digitisation projects taking place around the world, some commercially-driven, some undertaken with public money. 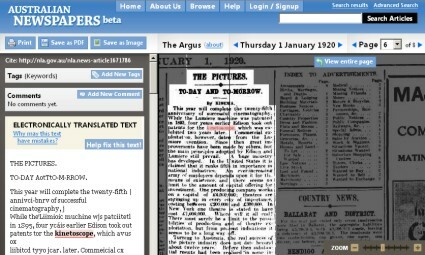 One long-awaited project has been the Australian Newspaper Digitisation Program, which has just reached the Beta test stage. The National Library of Australia, in collaboration the Australian State and Territory libraries, is undertaking a huge, long-term programme to digitise out of copyright Australian newspapers. 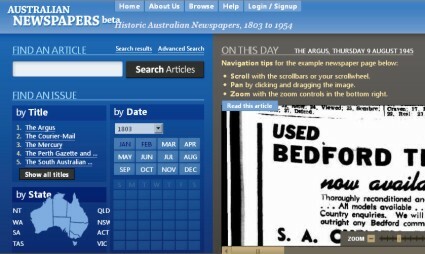 The aim is to produce a free online service allowing full-text searching of newspapers published in each Australian state an territory, from 1803 (when the first Australian newspaper was published, in Sydney), to 1954, when copyright kicks in (intriguingly late). The programme is ongoing, but on 25 July a Beta service was released to the public, offering 70,000 newspaper pages from 1803 onwards, with additional pages to be added each week (as of 8 August there are 91,577 pages available). The service is very much in test mode, and they request that users provide feedback (while bearing in mind that the service is not official as yet). So, how do we go about using it, and what is there to find on silent film? Simple search options are by any word within a text (uncorrected OCR), newspaper title (currently eleven on offer), state and date (with an attractively laid-out calendar option). You can use inverted commas to search on a phrase. The many advanced search options include combinations of terms, range of dates, length of article, and the option to search under types of article – advertising, detailed lists etc., family notices, news, and illustrated. You can also sort results by relevance, earliest or most recent date. In short, all the useful options that you would hope to see. Search results give a list of article titles with the name of the newspaper, date, page number and the first few lines of OCRed text. Most usefully, you are also given links for the same search term to the Australian National Bibiliographic Database and Picture Australia. The Article Display page, as illustrated above, shows the article with the search term highlighted, a zoom option and option to see the full page. On the left is the uncorrected OCR text, and options to add your own tags or comments (if you are logged in). And you can print, save as PDF, or save as image. Which pretty much covers everything. On film subjects, there is plenty – though with some surprising gaps, probably explained by the absence of those editions yet to be digitised. Inevitably, there much to be found on the early Australian film business itself. So, our traditional text term ‘kinetoscope’ yields only two hits (both from the 1920s). ‘Charlie Chaplin’ scores 927, ‘Mary Pickford’ 600, ‘Norma Talmadge’ 175, ‘Kinemacolor’ 32, ‘Vitagraph’ 123, ‘Cinematograph’ 685, and so on. Turning to Australian silent films, good subjects to investigate include ‘On Our Selection’ (280, but that includes stage versions and the 1932 sound film as well as the 1920 silent), ‘West’s Pictures’ (281 for a renowned exhibitor), ‘Frank Hurley’ (83 for Australia’s national photographer), ‘Australasian Films’ (79 for the leading native film company) and ‘Raymond Longford’ (27 for the film director). Finally, if you visit the Browse page, there’s a list of all the tags (keywords) that have been used to classify items – these include ‘classic movies’, ‘movie stars’ and ‘silent films’, but sadly only one article so far is so described. Time for us all to get tagging. I’ll be doing a fresh round-up of newspaper digitisation sites some time soon. Meanwhile, go explore. Even so, as you say, there’s loads of information on there: another boon for the historian. So a site to keep checking up on. I do think they’ve done the job very well. Take a look at what http://www.nambour-chronicle.com is doing. It’s an archive of the Nambour Chronicle & North Coast Advertiser first published in 1903. Very impressive. Thanks for letting me know about this. I’ll be doing a round-up post of digitised newspapers colelctions worldwide soon.